Radix Angelicae Tuhuo, Parasitic Loranthus, Eucommia Ulmoides, Radix Achyranthis Bidentatae, Fraxinus Bungeana, Poria Cocos, Cortex Cinnamomi, Saposhnikovia Divaricata, Ligusticum Wallichii, Radix Pseudostellariae, Radix Glycyrrhizae Preparata, Angelica Sinensis, Radices Paeoniae Alba, Dried Rehamnnia Root. 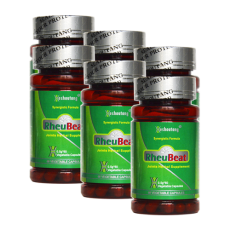 Rheubeat is formulated for removing wind-dampness toxin to improve arthritis. RheuBeat is suitable for patients with joint(s) pains. Over 200,000 people in the world have got good benefits from RheuBeat for their joints problems. © 2019 Heshoutang USA. All Rights Reserved.